RocketCop is an AIO Bot for Supreme, Shopify and Nike. It checkouts your items in seconds thanks to the best technologies. 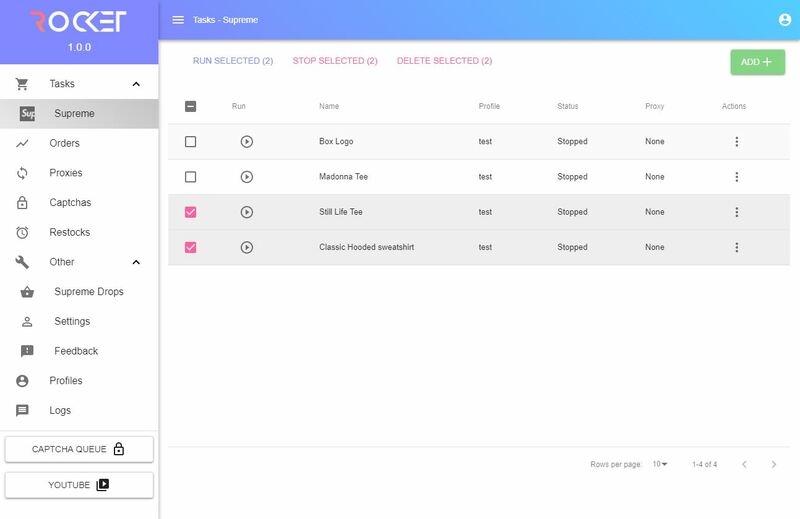 Other features: captcha harvester, restock and success monitors, proxy support, account creator and custom Shopify sites. The app is compatible with Windows, Mac OS and Linux. The price is $125 per one year, there are also some other plans, but prices are unknown, as far as RocketCop is sold out. Rocket Cop Bot is a new advanced stage in copping industry. There are a lot of bots which can provide good service in the shopping area. Sorry, but you are making an epic mistake. This platform provides the best service (not just the good one) for you and moreover presents clients the best experience. One of the most important demands of the 21st century is speed. Your request handles in a few seconds that is why shopping will not be the waste of time. No limits is another exponent of high quality of Rocket Cop Bot. Exclusive runner system helps platform handle with many tasks at the same time. For users it means that they will not have any problems with the Rocket Cop Bot. Checkout speeds are very high and captcha won't disturb you. Moreover, you can use this Software everywhere - such regions as USA, Canada and Europe are supported by Rocket Cop Bot and clients have an ability to monitor many shops at the same time! Different troubles in different countries – do not worry, professional team takes care about the clients. They provide 24/7 customer support and communication via email. It is hard to imagine, but it is not the last wonderful advantage. Another big plus is that Rocket Cop Bot is suitable for different OS platforms (for instance - Windows, Linux). New evolution stage in technology industry costs about 150 dollars. The price is very good for the progress!